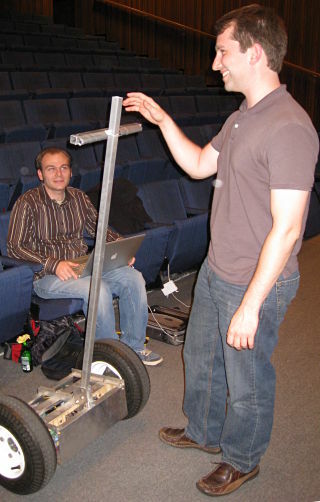 After presenting his software engineering Master thesis in Information Technology entitled The Evolution of a Self-Balancing Scooter, Jesse Kenneth Colman-McGill allowed attendees to ride the apparatus he developed in the Harvard’s Physics Department Machine Shop. To add MP4 video support to your system please install VLC Media Player, Apple QuickTime, or Miro Video Player, or just type “sudo apt-get install ubuntu-restricted-extras” in your Ubuntu Linux console. The opinions and views expressed on this website are not necessarily opinions of my current or any former employer. Except where otherwise noted, content on this website is available under the Creative Commons Attribution-ShareAlike 3.0 License. Third-party copyright protected content is reproduced in accordance with Title 17 of U.S.C. §107 and §108(a).